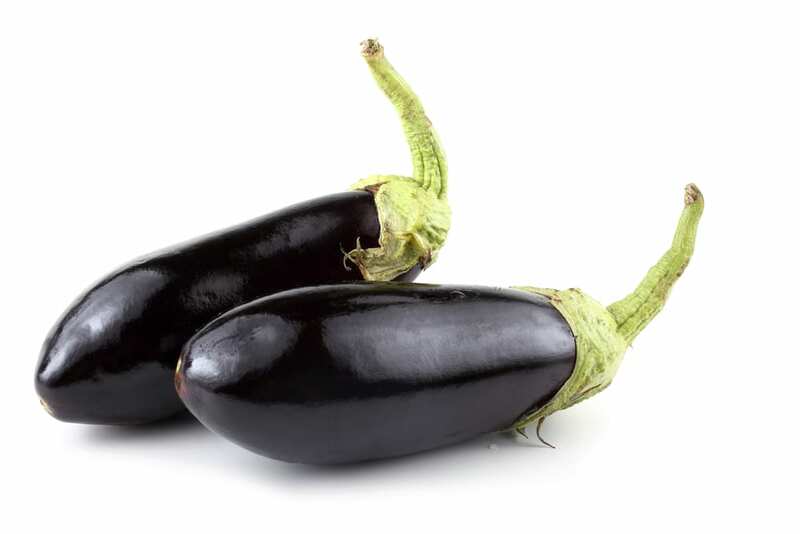 Eggplants are considered world’s healthiest food. 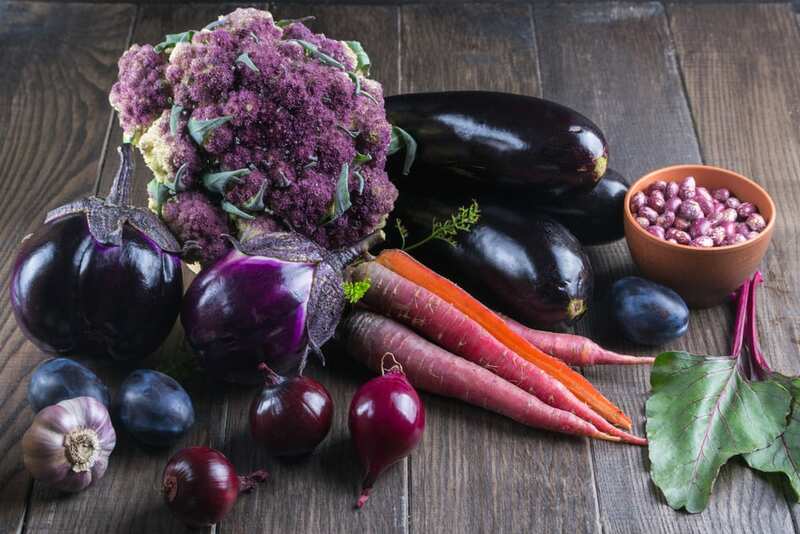 This purple, glossy beauty and it is unique taste and texture works wonder for your body. A cousin to tomatoes, peppers, and potatoes the eggplant gets its name from the first varieties of its kind which were round, and egg size. Try some of these recipes for maximising tastiness while cooking with this vegetable. 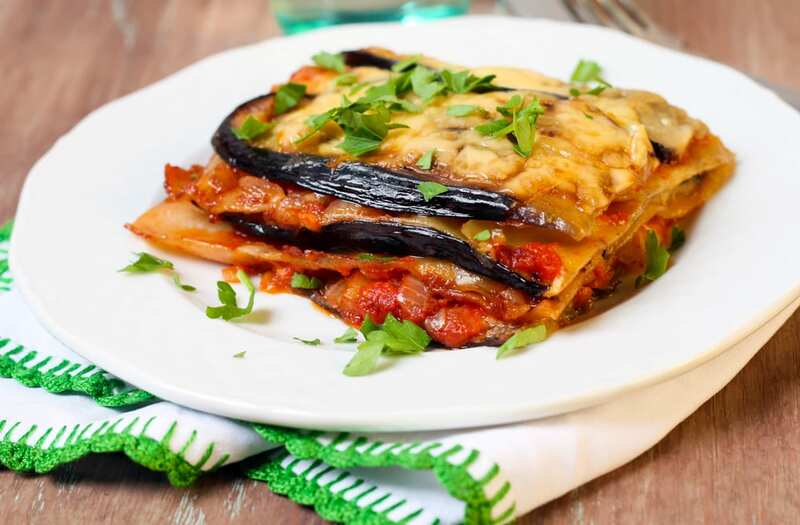 Here is a countdown of some of the best and easiest recipes of eggplant. Have a look! 1 Eggplant (1/4 inch slices), spaghetti sauce, white sauce, pepper, shredded Mozzarella cheese. -Microwave eggplant 4 minutes, covered, with a paper towel. -Spread 1/4 cup spaghetti sauce over bottom of baking dish. Put eggplant slices over sauce. -Cover with ¼ cup spaghetti sauce, 1/3 cup white sauce and 1/3 Mozzarella cheese. -Repeat layering and top with remaining cheese. -Cover dish and microwave for 10 minutes. 4 small eggplants, 2 tbsp. olive oil, 1/4th tsp fine sea salt, 1/8th tsp black pepper, 1/3 cup fresh basil, 2 tsp chopped sage, 2 tsp chopped fresh rosemary. -Cut eggplant into ¼ inch slices but do not cut through stem. -Place them on baking sheet lined with parchment paper. Brush oil over eggplant slices. -Bake at 450°F for 15 minutes and remove from oven. 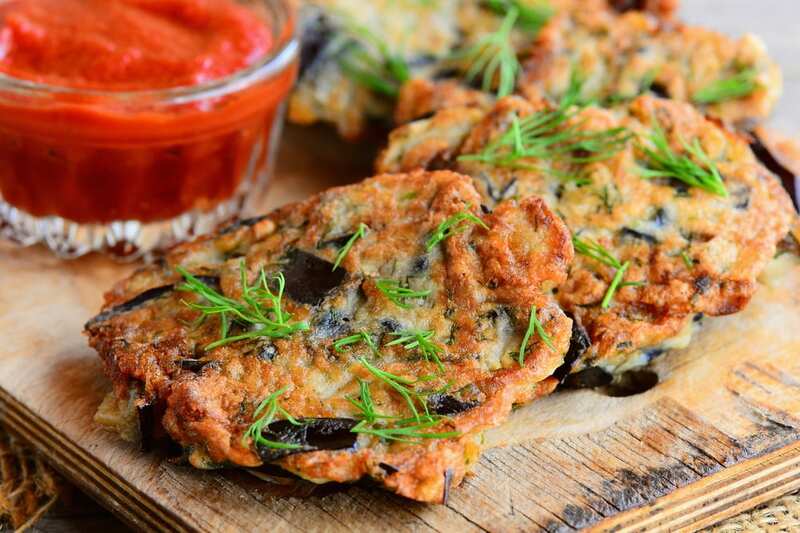 -Brush eggplant with ½ tsp oil and sprinkle salt and pepper and again bake for 10 minutes. -Pour 1/2 cup of the sauce into a baking dish. -Cut eggplant into halves. Layer 1/3 of eggplant and 1/3 cup sauce in baking dish. -Cover and microwave on high (100%) 6 minutes. 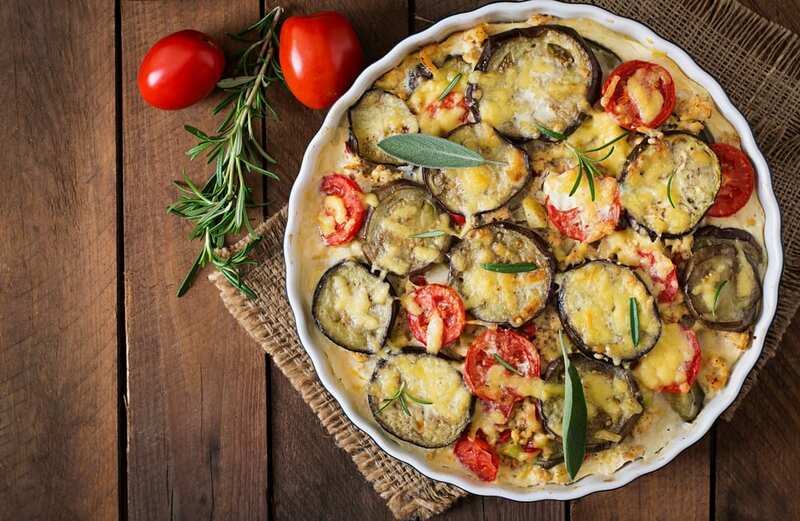 -Sprinkle eggplant with Cheddar cheese; rotate baking dish 1/2 turn. Microwave on medium-high (70%) until hot and bubbly and cheese is melted for 2 to 4 minutes. 1 cup white rice, ½ cup hoisin sauce, 3 tbsp. rice vinegar, 1 tsp corn starch, 4 tbsp. canola oil, 1 pound firm tofu, 1 small eggplant, 2 cloves garlic, 1 red jalapeno chili, ¼ cup basil leaves, kosher salt. -Cook the rice. In a small bowl whisk together the hoisin, vinegar and corn starch. -Heat 1 tbsp. oil. Add tofu and cook until brown and transfer to a plate. -Add 3 tbsp. oil to a skillet and then add eggplant, garlic, chili, and ¼ tsp salt. Now add hoisin sauce, tofu and cook. Serve with rice and sprinkle with the basil. Olive oil, celery stalks sliced, 1 eggplant, grape tomatoes, ¼ cup tomato paste, ¼ cup white wine vinegar, kosher salt, black pepper, 1 tbsp. sugar, 2 tbsp. capers, ¼ cup pine nuts, 1 cup parsley, 1 pound dried penne. -Heat oil and add celery and cook for 3 minutes. Stir in the eggplant and tomatoes. -In a bowl combine tomato paste, vinegar, ¼ cup water, 2 tsp salt, pepper and sugar. Stir into eggplant mixture. -Cover and reduce heat. Cook for 15-20 minutes. -Stir in the capers, pine nuts and parsley. -Cook the penne and combine with eggplant mixture and serve. 1 ½ cup rice, 2 garlic cloves, 1 tbsp. grated ginger, olive oil, 2 tsp Thai red curry, 3 small eggplants, ½ head cauliflower, chickpeas, 2 bean sprouts, ½ cup basil. -In a saucepan combine rice, salt, water and bring to boil. -Cover and simmer for 15 minutes. -Whisk together garlic, ginger, oil, curry paste, salt. Toss with eggplants and cauliflower. -Transfer to a roasting pan and roast for 30 minutes and add chickpeas during last 5 minutes. -Remove vegetables from oven and toss with bean sprouts and basil. 1 cup rice, salt, black pepper, olive oil, 1 onion, 2 cherry tomatoes, 1 eggplant, 1 ½ tsp curry powder, chickpeas, basil. -In a saucepan combine rice, water, and salt and bring to boil. Stir the rice and reduce heat. Simmer for 8 minutes. -Meanwhile, heat oil in a pan, add onion and fry until soft. Stir in tomatoes, eggplant, curry powder, salt, pepper. Cook for 2 minutes. -Add 2 cups of water and bring to boil. Stir in chickpeas and cook for 3 more minutes. Remove the vegetables from heat and stir in basil. Tomatoes, 1 clove garlic, olive oil, salt, black pepper, 2 eggplants, 1 cup ricotta, 1 egg, basil, grated Asiago. -Heat broiler. In a food processor puree tomatoes, garlic oil, salt and pepper. 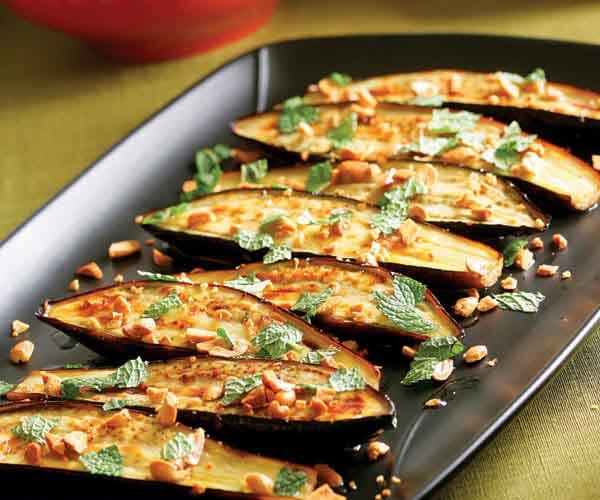 -Arrange eggplant slices on baking sheet and brush with oil. Put salt and pepper. Broil until tender. -In a bowl combine ricotta, egg, salt and pepper. Spread tomato sauce in bottom of baking dish. On top of it layer eggplant slices and ricotta mixture. Repeat with another layer and top with tomato sauce and Asiago. -Reduce oven to 400°F. 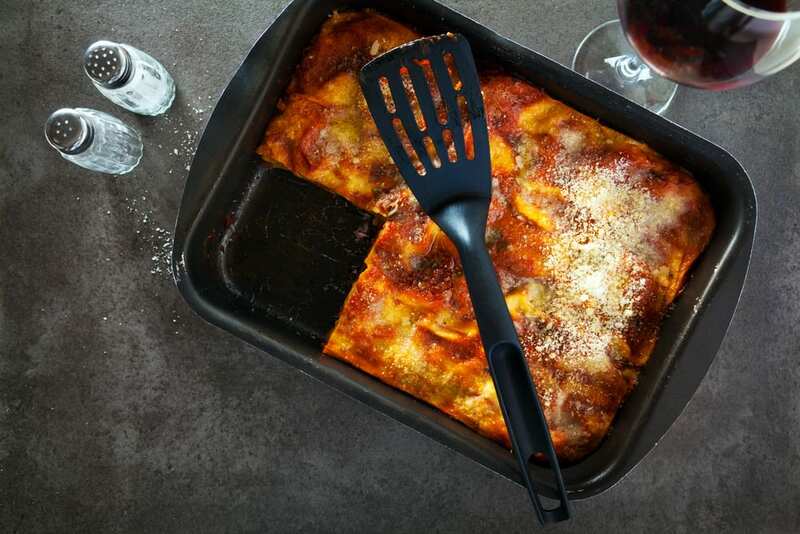 Bake lasagne until bubbling. 2 small eggplants, fine dry bread crumbs, 2 eggs, 4 tbsp. parsley, grated parmesan cheese, dried Italian seasoning, ¼ tsp celery seed, ¼ tsp garlic and onion powder, salt, pepper, olive oil. -Take 2 trays and in 1st tray measure bread crumbs, parsley, celery seed, cheese, garlic and onion powder. -In 2nd tray beat two eggs and add parsley and cheese. -Heat a pan with oil and add garlic cloves and remove before browning. -Dip eggplant into egg mixture and then in bread crumbs. -Fry in hot oil and season it with salt and pepper. 2 small eggplants, 2 tbsp. oil, 1 packet Italian herb mix, tomato sauce, 6 cloves garlic, wine, sliced Mozzarella cheese, minced parsley. 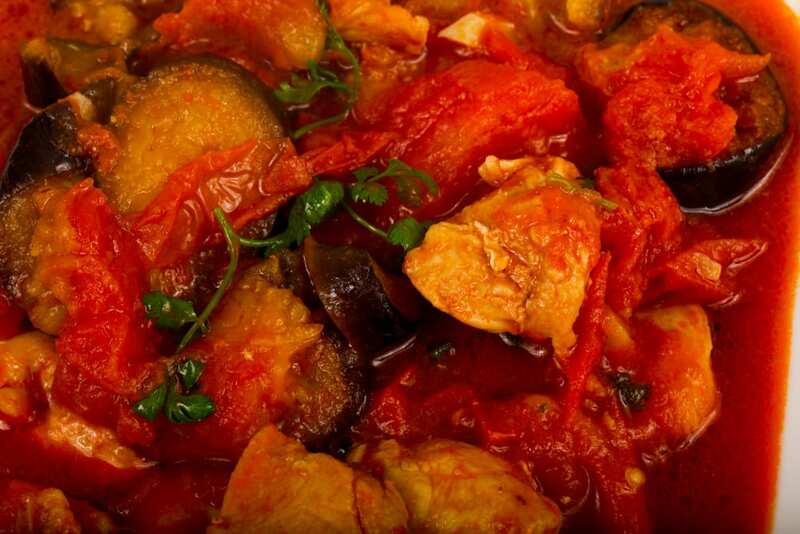 -Marinate 4 garlic cloves minced overnight in tomato sauce, herb mixture and wine. 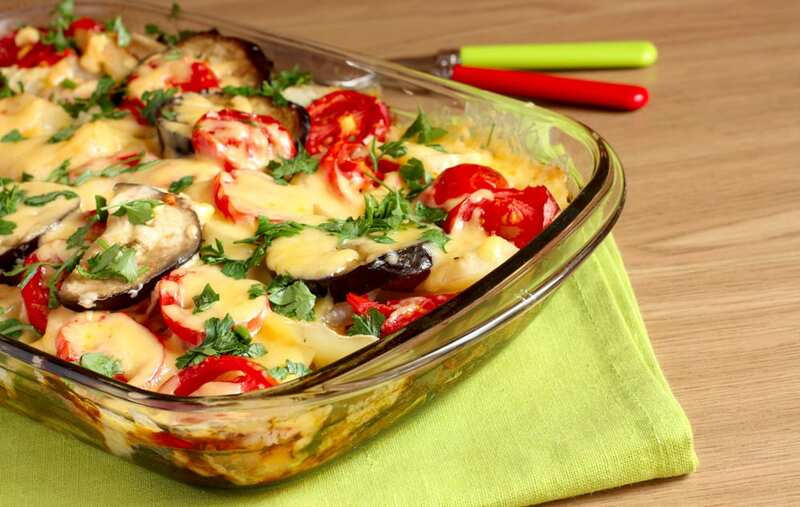 -Coat medium size casserole with oil and layer the eggplant with remainder of minced garlic. -Pour 3/4 of the tomato mixture over eggplant and layer cheese on top. -Add remainder of sauce and sprinkle with minced parsley. Bake 45 minutes in 350°F oven. 1 Eggplant, onion, tomatoes, salt, pepper, basil, oregano, sliced Parmesan cheese. -Saute onion in a little oil. -Slice an eggplant; brown on both sides. -Toss in tomatoes and let simmer until tender. Now add salt, pepper, basil, and oregano to taste. Sprinkle Parmesan cheese if desired. -Saute chopped onions in oil until transparent. -Cut lamb into bite size pieces. Add meat and spices, cook until browned about 10 minutes. -Add pine nuts and simmer. Peel eggplant and remove centers. Arrange slices in a large baking dish. 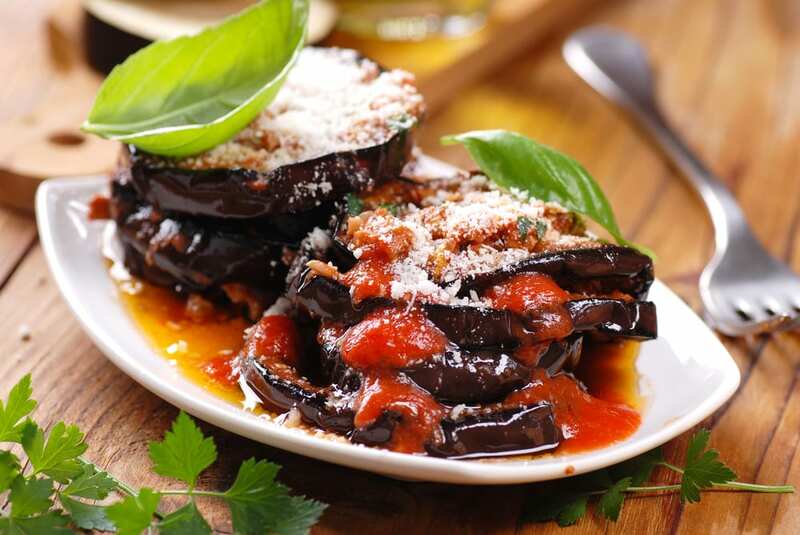 -Fill centers with meat filling and top with leftover pieces of eggplant and slice of tomato. -Cover and bake 30 minutes at 450°. Reduce heat to 400°, bake 45 minutes more. 2 large eggplants, bread crumbs, grated Romano, 1 tbsp. parsley, 1 tbsp. basil, ½ tsp. black pepper, 1 egg, ¼ cup milk, salt, Mozzarella cheese, tomato sauce. -Mix egg and milk and set aside. Mix all other ingredients. -Dip slices of eggplant into egg mixture, then into crumb mixture. Lay flat on a greased cookie sheet and bake at 350°F for 20 minutes. -Turn once. Spoon a little sauce on the bottom of a large casserole dish. 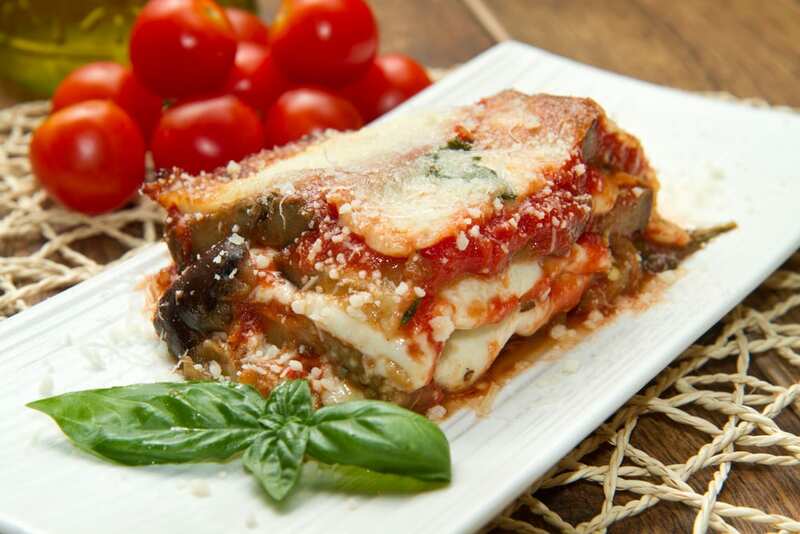 Layer slices of eggplant, sauce and grated Mozzarella. 1 eggplant, ½ bulk sausage, 1 onion, 1 egg, ½ cup bread crumb,1 tbsp. butter, ¼ cup cracker crumbs. 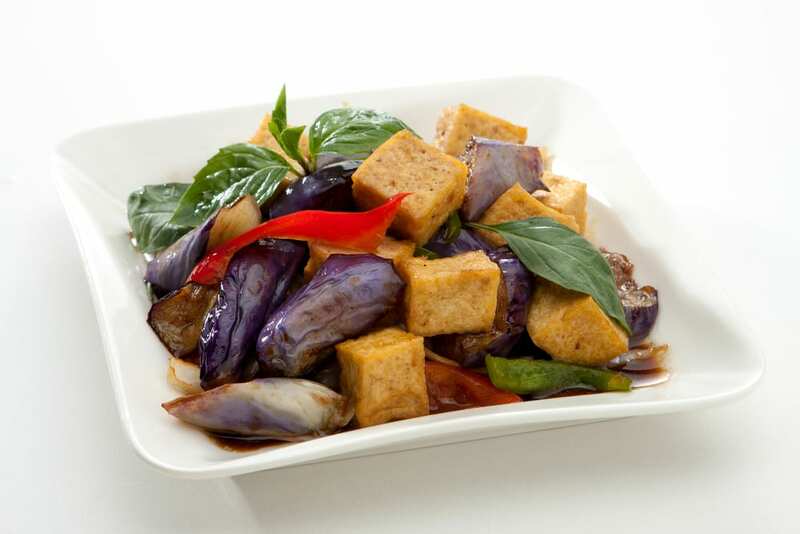 -Peel eggplant and cut into 1 inch cube; cook in a small amount of boiling water for 10 minutes or until tender. -Cook sausage and onion until onion is tender and sausage is brown. -Combine eggplant, sausage mixture, egg and bread crumbs. -Mix well and spoon into a greased 1 quart casserole. -Combine butter and cracker crumbs; sprinkle over casserole. Bake at 350° for 25 minutes. 1 eggplant peeled, ½ stick melted butter, seasoned Italian bread crumbs, spaghetti sauce, sliced Mozzarella cheese, oregano. -Slice eggplant into 1/3 to 1/2 inch thick slices (cut crosswise). -Dip slices in butter and then bread crumbs. Sprinkle slices with oregano if desired. -Spoon spaghetti sauce on top of each slice. 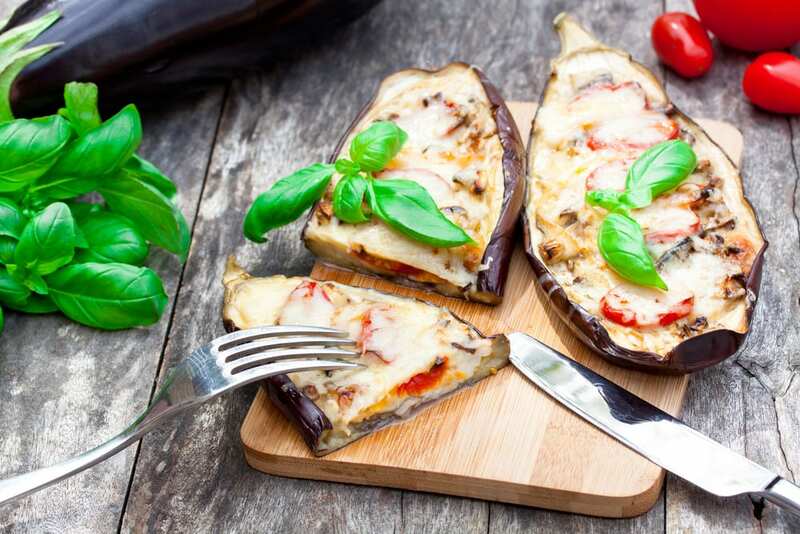 -Top eggplant with a slice of cheese. 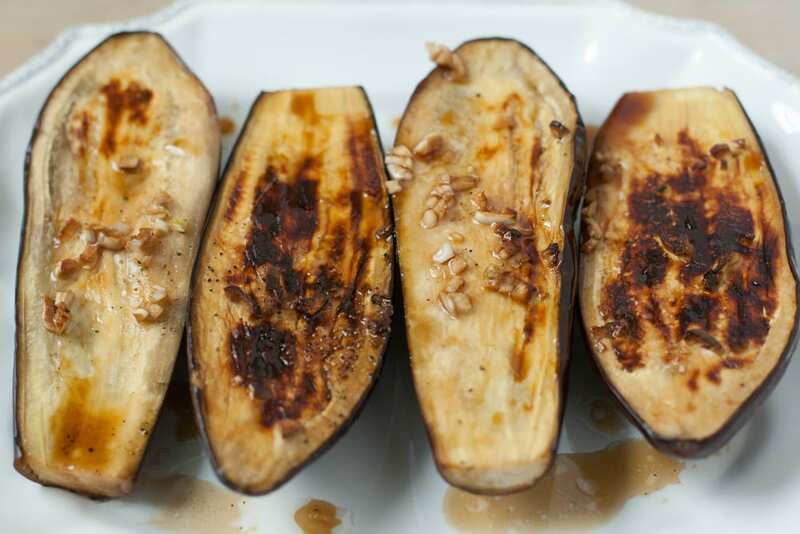 Place eggplant in a 400° oven for about 15-20 minutes or until cheese is slightly brown. 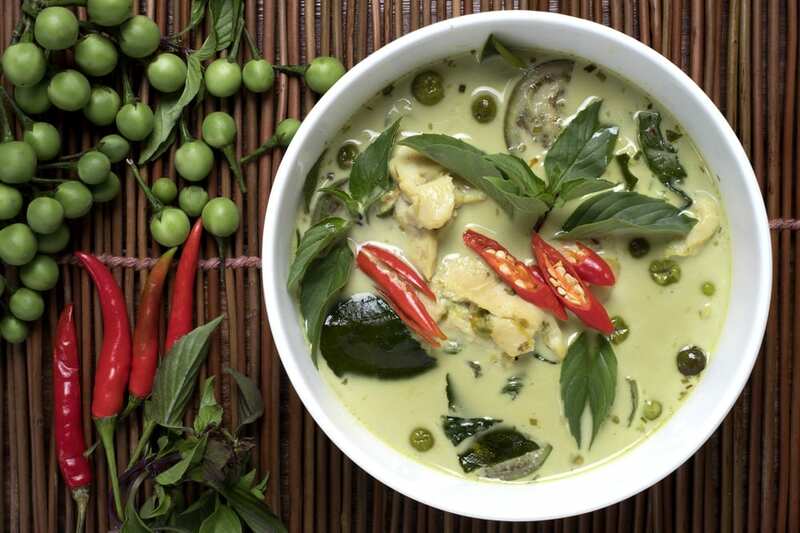 Green curry paste, coconut milk, water,1 cube chicken base, 1 small can bamboo shoots, basil leaves, 2 large chicken breasts (cooked), 4-5 Thai eggplant, salt. -Begin by boiling coconut milk and curry paste in a large sauce pan for 5 minutes. Add water, chicken base, and basil. -Bring back to a boil and cook until basil is tender (3-5 minutes). Add bamboo shoots and eggplant. -Lower heat and simmer until eggplant is tender. Add cooked chicken. -Cook until chicken is heated through, then serve with rice. 2 eggplants, seasoned bread crumbs, Parmesan cheese, mayonnaise, tomato Sauce, mozzarella cheese. -Cut eggplant into 1/2 inch slices. Combine bread crumbs and 1/4 cup Parmesan cheese. -Spread mayonnaise on both sides of eggplant slices. -Dip into crumb mixture. Bake on cookie sheet 425° for 15 minutes. -Grease baking dish. Place eggplant slices, overlapping in dish. Spread tomato Sauce. Place mozzarella cheese on top. -Sprinkle remaining Parmesan cheese and spread remaining sauce. Bake at 375° for 15 minutes. 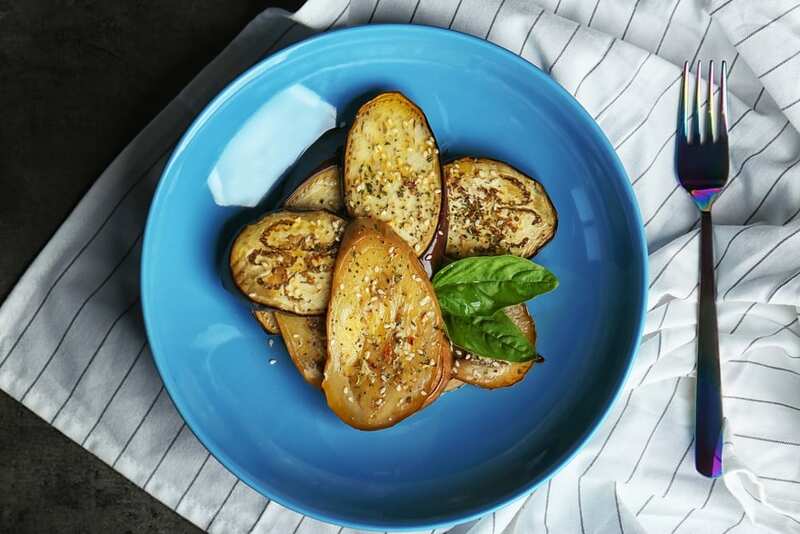 This incredibly versatile eggplant works in everything from Italian to Asian recipes. So what are you waiting for try these mouth- watering dishes and make eggplant the star ingredient with this comprehensive recipe collection.